I don't know about you, but I love Mango's. But they are really only good a few months out of the year. I wanted to preserve the taste for the entire year so I made Mango Jam. This mango jam recipe is quick and easy and delicious. In Idaho, Utah, Wyoming, Arizona, Nevada and maybe some other states we have this thing called Bountiful Baskets (which I totally LOVE). You can find out more about it here. Anyway, a couple of weeks ago I purchased extra mangos. My hubby loves them (but he loves native ones not imported ones). Then last week we received mangos. My sister also gets a basket and they did not like mangos. So needless to say we had mangos growing out of our ears so to say. Yesterday, I had to figure out what to do with 10-15 mangos. I found this recipe. 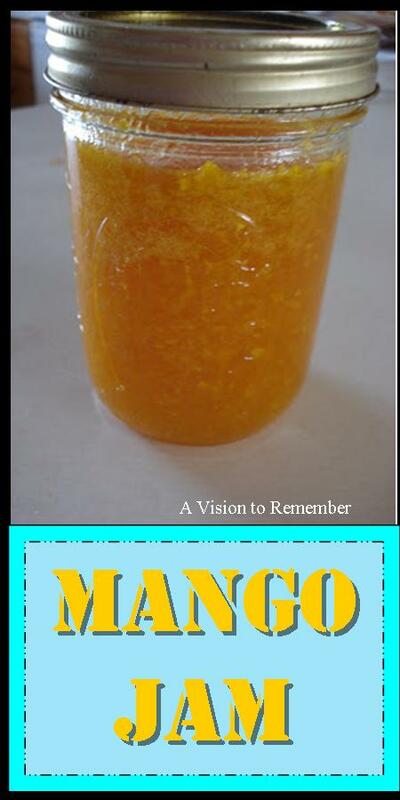 It is a great mango jam recipes. Now I really am not a fan of mangos. I think they have a weird taste. So I really did not expect to like it. This looks so good. Mangos are a favorite around here. I just made wild violet jelly - courtesy of my neighbor's lawn. Will have to try this recipe too! Thanks for sharing! This looks good. I've never had mango jam before. Sound good though. YUM!! That looks delicious. I love jams/jellies in different flavors than strawberry and the other norms. Pinning it! It looks wonderful ! I use mangos in my smoothies to add more creamy texture the blend! YUM! Thanks for a great recipe! I love mangoes, and this is a great way to use them! I love mangos. I have never tried them in a jam, sounds yummy. I have never thought to make mango jam. I bet it was SO good on those homemade rolls! I'm thinking it would be fabulous on waffles with fresh whipped cream and tropical fruit...why do I not have 10-15 extra mangoes hanging around my house? I've never even thought of making a jam with from mango. The link didn't work for me (might be my computer) so I'll search for recipes so I can make some too.